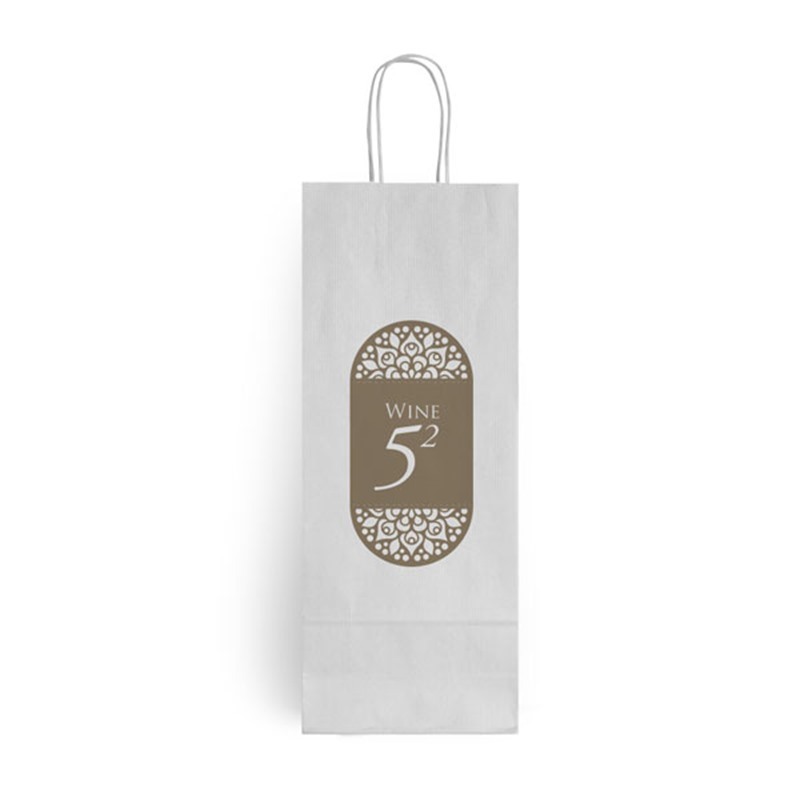 The versatility and value for money offered by this type of one bottle bag make it one of the most popular products as we can print on our stock bags, the minimum runs start from only 250 bags too! 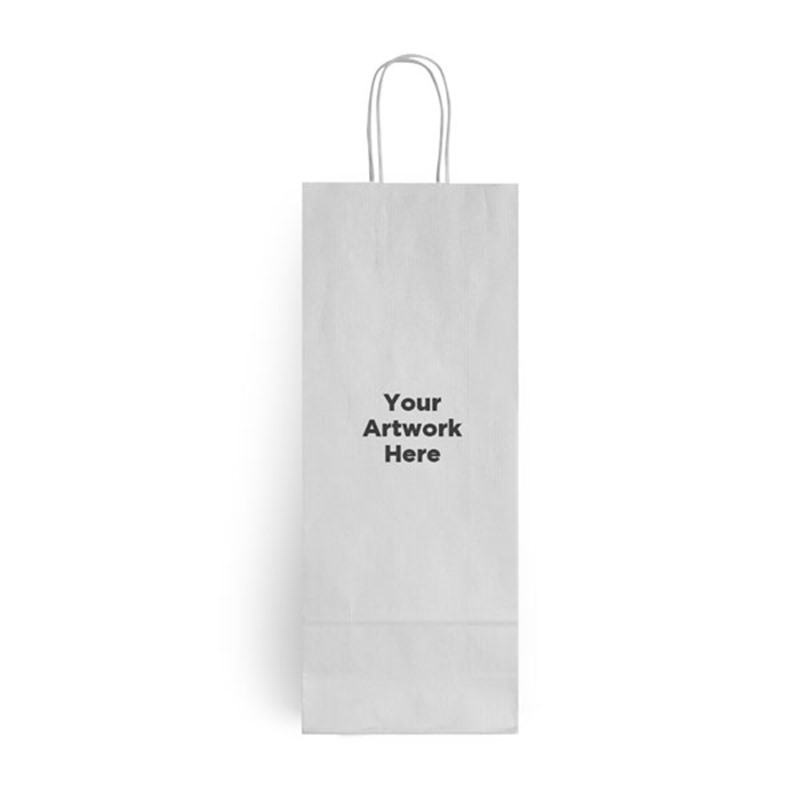 Standard delivery time on these bags is 2-3 weeks, if we are overprinting on our stock bags For larger runs, the turnaround time is slightly longer, it can be from 4 to 6 weeks. Great for retailers, promotional use at events, cafes, restaurants, gift stores and many other uses. Overprinting - as we are printing on our stock bags, we can supply great low minimum order quantities from 250 or one box, whichever is greater. If you are ordering over 3,000 bags then it no longer becomes cost effective to print onto our stock bags, it is more efficient to print and manufacture directly. Overprint - Short runs can be printed onto our stock, please see the website for our current collection to check which colours are available. Automatic - We can flood printing when printing large runs. Just send us your pantone number (check with salesman for the correct type) and we will try and match this colour. 120GSM Plain & Ribbed Kraft. Overprint: Flexo Overprint 2 colours max. Flexographic (flexo) printing is a form of printing that uses a flexible printing plate to transfer the ink onto the substrate being printed. It is used for printing on many different types of substrate including plastic, metallic films, cellophane and paper. The printing capability is lower than lithographic printing, typically achieving only 40DPI on the most basic printers, rising to 120dpi on the most advanced. We use 2 types of flexo printing press, a stack printer and central impression (CI) printing press. Allows printing onto pre-fabricated items so is perfect for short print runs. It can be 1 or 2 colours in line. A conveyer belt takes the item runs it through the print rollers. The item is then deposited into a tray for packing. The best print results are on flat surfaces so the print area available is limited by the construction of the bag. Also due to the uncontrolled nature of the printing, registration cannot be guaranteed. The maximum tone available is 40DPI and reverse out printing is not recommended. Flexo Stack 4 spot colours max. A type of multi-colour press used in flexography in which all the colour stations—from one to eight stations, with six being the most common—are oriented in a vertical stack, the substrate passing through each one, which lays down successive colours. Some stack presses comprise two parallel stacks, the web of substrate taking a U-shaped path through the press.Each colour station possesses its own independent set of inking rollers, plate cylinder, and impression cylinder. They offer quick setup which is great for short runs; however they tend to have a lower DPI for tone work and are unable to maintain tight registration. Flexo CI 6 colours max. A type of printing press used in multi-colour flexography in which a single large-diameter common impression cylinder supports the substrate as it contacts a series of adjacent plate cylinders, which lay down successive colours. Central impression presses can have anywhere from two to eight printing units, with six being the most common. The advantage of this configuration is that you can print at a much faster rate than a stack press while maintaining much tighter registration and a higher DPI. Unfortunately they take longer to set up and so are not used on short runs. We source are goods from multiple locations including the UK, Europe, Indian sub-continent and the Far East. Overprint - Short runs can be printed onto our stock, please see the website for our current collection to check which sizes are available. Automatic - For larger runs, a number of sizing options are available above and beyond our stock sizes, please contact our sales department to discuss further. The paper is all sourced from FSC sources which means that the forests are all managed and maintained responsibility The bags are fully recyclable and will also bio degrade as they are made from paper. Gloss/matt varnish, coloured twist cords, cotton covered coloured twist cords, bottom card reinforcement (far east).